Today I will be reviewing Pink Linings twice as nice bag in the colour cream bows on red. The bag features two zipable outside pockets, the front one as pictured above is decorated in a stitched nature design with two prams and two lovebirds in the tree, it is useful for storing all our mummy essentials, such as our keys, phone and debit or credit cards in the internal card holder. 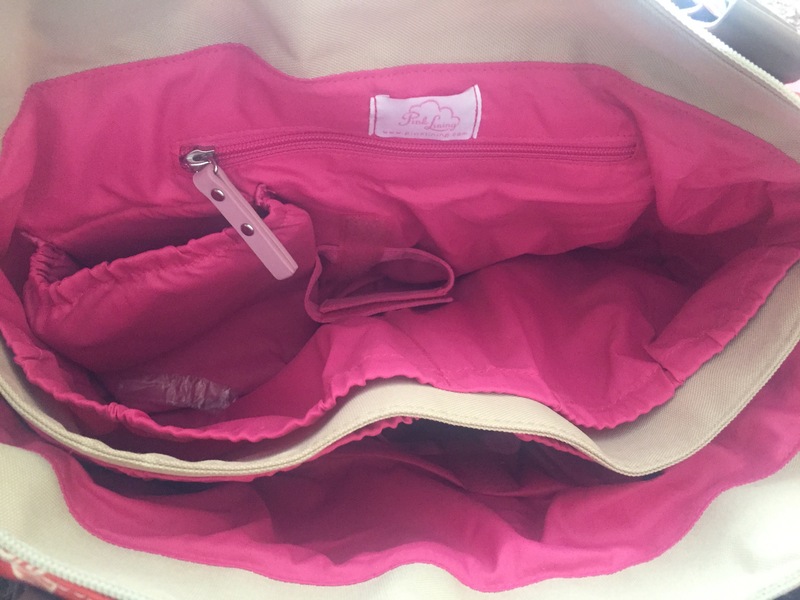 The outer back pocket is fabulous for storing the pink lining wipeable changing mat and wet bag pictured below. 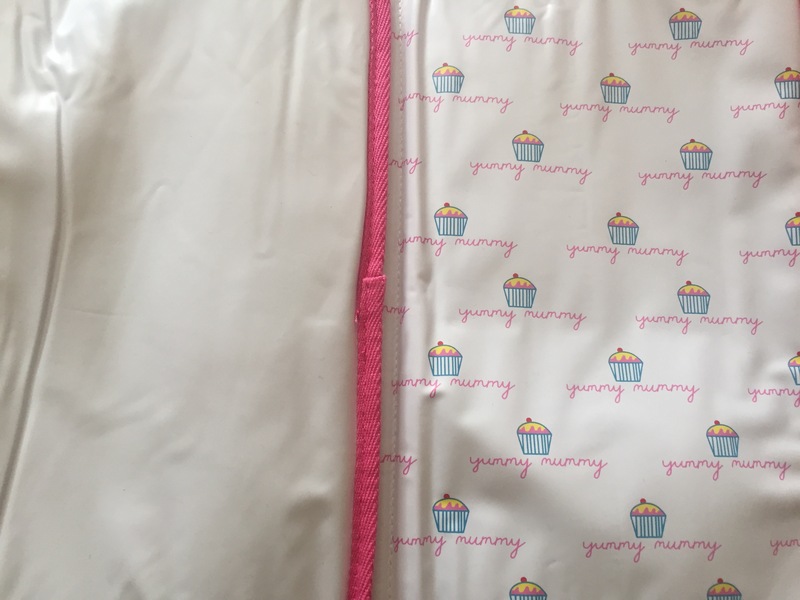 The bag also includes two handy elasticated pockets at either end of the bag, again useful for storing a toddlers sippy cup and a drink for yourself. The bag is lined with pink linings signature hot pink fabric, again this is easily wipeable for any spills that may occur. This bag includes plenty of storage pockets including one zipable compartment, two insulated bottle pockets with two extra insulated bottle holders keep bottle warm or cold for 4 hours, the bottle Holders Velcro on and off the inside of the bag (not pictured currently in use) and 4x large pockets which I use for storing my toddlers nappies and wipes one side and my newborns nappies and wipes the other. The bag also comes with a pen holder, key fob, mirror and an internal phone pocket. Pink linings twice as nice bag also features a removable adjustable strap perfect for wearing over the shoulder or across the body as a messenger bag. 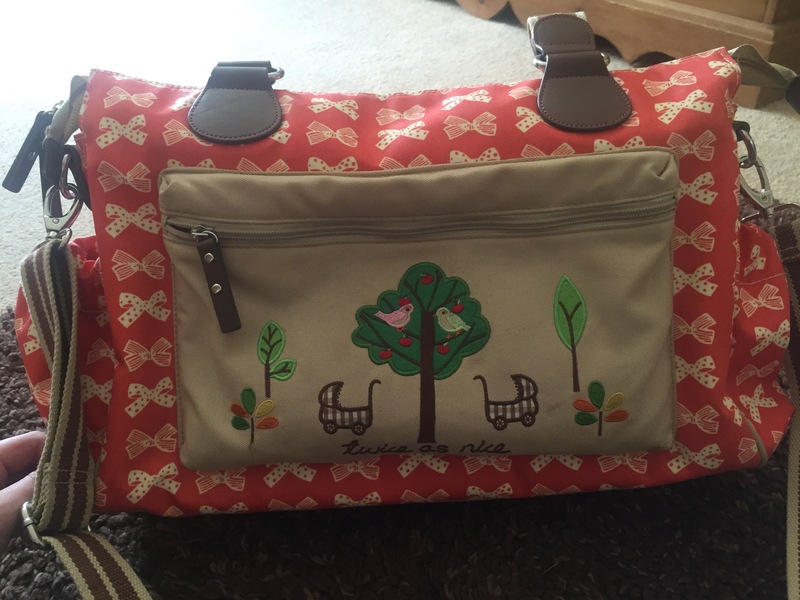 It also includes regular handles on the bag with an added popper fastener perfect for attaching to your pram or travel system. – Large perfect for twins or two children close in age. – Water resistant and wipeable. – Plenty of internal pockets to keep things organised and easy accessible. – Bulky when just popping out or only looking after one child. – The canvas on the bag ( outside front pocket and underneath the bag) gets dirty easily, but marks are easily removed using a stain remover spray and a scrub. In my opinion this bag truly lives up to its name of being perfect for someone with two children. It’s made to a high standard with its consumers needs met, and the designs and colours available for this bag are beautiful. UNITED KINGDOM pink lining store currently have the options of cream bows on red ( pictured above) sunflower, cottage garden, Dalmatian and birdcage. UNITED STATES Pink lining store are currently offering the same as the UK store as listed above. If you have anymore questions regarding this bag the please leave your questions below and I will answer them for you.